Jewish convert to Christianity; born in Russia; died in the last quarter of the nineteenth century. After having tried many professions, among them photography, tuition, and commerce, he embraced Christianity. Supplied with his certificate of baptism, which entitled him to an official position, he was appointed professor of Hebrew in the seminary at Minsk, and at the same time was charged by the Holy Synod to devise means of spreading Christianity among the Jews. 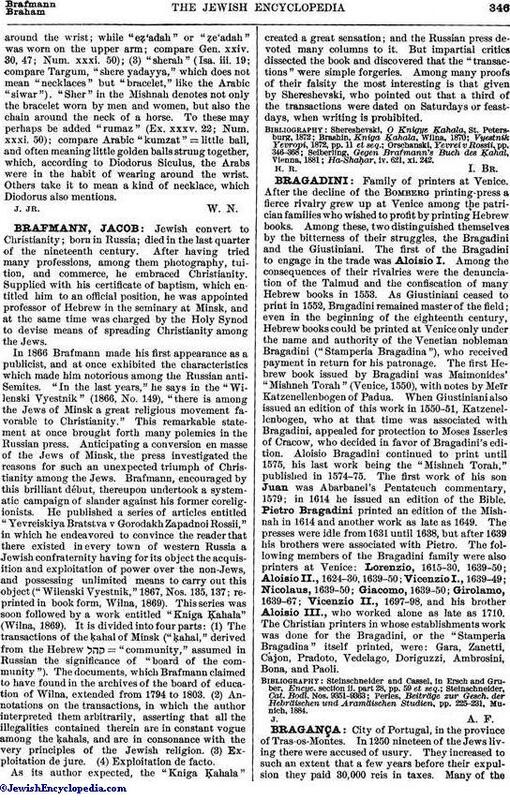 In 1866 Brafmann made his first appearance as a publicist, and at once exhibited the characteristics which made him notorious among the Russian anti-Semites. "In the last years," he says in the "Wilenski Vyestnik" (1866, No. 149), "there is among the Jews of Minsk a great religious movement favorable to Christianity." This remarkable statement at once brought forth many polemics in the Russian press. Anticipating a conversion en masse of the Jews of Minsk, the press investigated the reasons for such an unexpected triumph of Christianity among the Jews. Brafmann, encouraged by this brilliant début, thereupon undertook a systematic campaign of slander against his former coreligionists. He published a series of articles entitled "Yevreiskiya Bratstva v Gorodakh Zapadnoi Rossii," in which he endeavored to convince the reader that there existed in every town of western Russia a Jewish confraternity having for its object the acquisition and exploitation of power over the non-Jews, and possessing unlimited means to carry out this object ("Wilenski Vyestnik," 1867, Nos. 135, 137; reprinted in book form, Wilna, 1869). This series was soon followed by a work entitled "Kniga Ḳahala" (Wilna, 1869). It is divided into four parts: (1) The transactions of the ḳahal of Minsk ("ḳahal," derived from the Hebrew = "community," assumed in Russian the significance of "board of the community"). The documents, which Brafmann claimed to have found in the archives of the board of education of Wilna, extended from 1794 to 1803. (2) Annotations on the transactions, in which the author interpreted them arbitrarily, asserting that all the illegalities contained therein are in constant vogue among the ḳahals, and are in consonance with the very principles of the Jewish religion. (3) Exploitation de jure. (4) Exploitation de facto. As its author expected, the "Kniga Ḳahala" created a great sensation; and the Russian press devoted many columns to it. But impartial critics dissected the book and discovered that the "transactions" were simple forgeries. Among many proofs of their falsity the most interesting is that given by Shereshevski, who pointed out that a third of the transactions were dated on Saturdays or feast-days, when writing is prohibited. Ha-Shaḥar, iv. 621, xi. 242.